Chase Magnett: The British Invasion of the 1980’s is one of the most important events in modern comics history. Creators like Alan Moore, Neil Gaiman, Grant Morrison, and many others first rose to prominence in the late 80’s. Their diverse body of work changed not only the superhero comics which they were brought across the pond to write, but Western comics as a whole. They had strong authorial voices which they used to experiment with the medium and explore new ideas. Even today, the effects of that period are still felt; much of Moore’s work has yet to fall out of print, Gaiman’s Sandman has returned for a new series, and Morrison’s DOOM Patrol and other series are being revitalized in hardcovers. Few characters capture what it meant to be part of this moment in comics history in the same way that John Constantine does. Created by Alan Moore in the pages of Saga of the Swamp Thing, he was written in his own series by British and Irish creators like Jamie Delano, Garth Ennis, Grant Morrison, Neil Gaiman, and Warren Ellis. It’s no surprise that Ellis chooses a Constantine analog, Jack Carter, to explore this period. Ellis is well suited to explore the causes and effects of these comics. He was part of the third wave of Vertigo writers, following up the earlier works at Vertigo with comics like Transmetropolitan (which plays into this story as well) and lived in England while Margaret Thatcher was Prime Minister between 1979 and 1990. He focuses on her government as the central cause for the weirdness and anxiety present in these comics. It’s an analysis that, while somewhat simplistic, discovers an important connective tissue between all of these creators and their works. In his introduction to V for Vendetta in 1988, Moore wrote of England, “It’s cold and it’s mean spirited and I don’t like it here anymore.” That sense of removal and fear can be found in almost every homage from Cassaday. It’s also a period of history that is difficult for Americans to completely understand. Thatcher was a far less affable leader than Ronald Reagan and is still loathed in many parts of the country. Her policies were divisive and harmful, especially to blue collar workers and unionized labor. American readers benefited from her unintentional effect on creators, but did not have to struggle with her government. That pain is palpable in the overcast coloring and solemn expressions of Cassaday’s work. It captures the mood of these comics very well without mocking them too much. This is obviously the big overview of the issue dealing with the complex economic and political issues that helped to create the works Ellis is examining. Ray, how effective of a guide do you think Jack Carter makes to this complex scene? Ray Sonne: In terms of 80’s comics, Hellblazer was the ultimate example of the British Invasion, wasn’t it? It was so successful that Vertigo published it between 1988 to 2013. 25 years. Not only that, but John Constantine was very much the British impression on American comics. A testament to this is his introduction in Swamp Thing, since it was a property created by Americans, but in its most famous state a revitalization by Alan Moore, Stephen Bissette, and John Totleben. There are tons of homages in this issue of Planetary, most of which that came after Hellblazer’s first issue. Sandman #1 came out in 1989. That same year saw Morrison’s first Doom Patrol issue with Richard Case on pencils. While superhero comics were also heading to places no one had seen before, to me they were a little stagnant in comparison. Sure, Frank Miller got a few good jabs at Ronald Reagan and his policies in 1986s The Dark Knight Returns, but his dystopia was still at a safe distance. The above mentioned Vertigo comics weren’t. Their creators were embroiled in grimness and oppression every day. Constantine’s bitterness and cynicism could very much reflect that and that’s why Planetary #7 follows the basic structure of a Hellblazer issue to a tee. Dark cover with a translucent picture and a creepy, mystical, faintly Satanic quote; A poetic title like “To Be in England, in the Summertime”; Lots of British slang to the point where it’d be surprising to hear if Ellis managed to miss a single swear word; This issue’s got it all. So Jack Carter not only works as a guide, but his “death” is also the death of an era. The funeral gathering, in truth, is not just his. It’s for all the characters that we see on these pages (or at least those particular iterations of them, since both Animal Man and Swamp Thing were brought into the main DC canon in 2010). It’s fitting, given that funerals are meant to be a ceremony of reflection of the years one spent on this Earth. I’m not so sure I agree with Snow’s (Ellis’s) observation that “they look faintly ridiculous” since there is a certain timelessness to many of the characters we see. The themes of systematic oppression that echo throughout their existences is something, unfortunately, always relevant. What really does wrap the comic back to this point, as always, is the aesthetic. Chase, is there anything that really stuck out to you in this issue? CM: John Cassaday does an excellent job of establishing the aesthetic in this issue. All of the analog characters are morphed into a variety of ridiculous forms. They ultimately appear to be separate from the story because their appearance is so disassociated with that of Planetary or Jack Carter. When the analogs are featured in the foreground of a panel, it’s like looking through a window onto a different story instead of watching the current one unfold. That distance between Planetary as contemporary, living characters and these others as relics of the past is also created in setting. David Baron offers a London that is constantly overcast in navy hues and blacks. It’s a place that Planetary is only visiting, not one where anything is currently happening. This all connects to Ellis’ criticism that the Vertigo comics of the late 1980’s served a valuable purpose, but are no longer relevant to contemporary comics. It makes sense that he sets much of the story in a graveyard, considering he is expressing a desire to bury the past in order to move forward. Cassaday constructs another interesting visual aesthetic in this issue when a superhero crash-lands into the midst of the story. The hero is dirty and distraught. He screams about being ruined by Jack Carter, his origin and morality both having been inverted from that of a clean and noble archetype. The depiction of this character is distanced from that of the Planetary team as well, but in a different way. Whereas the earlier analogs were treated solemnly and with some degree of respect, this hero is filthy and covered in horrible details. 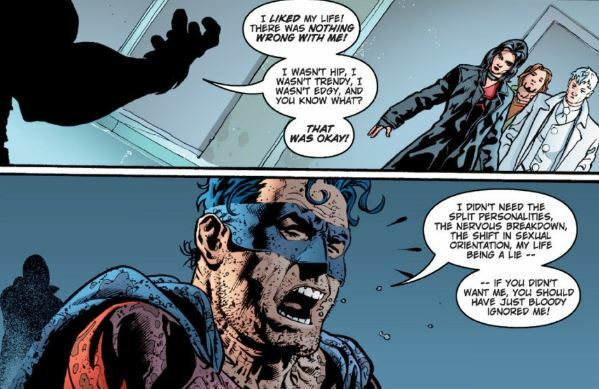 Although Garth Ennis and Darick Robertson’s The Boys would not debut for another nine years, there’s are clear similarities in both Cassaday and Robertson’s depiction of the superhero. Here is Ellis’ reason as to why the stories of this era need to be left behind. The warped nature of this stand-in for superhero comics is ugly and dumb. He is the result of creators attempting to replicate the successes of the late 80’s rather than moving on with new ideas. What was once interesting or inventive is now loud and obvious. One point you rose that struck me as interesting was the recent resurrection of characters like Swamp Thing and Animal Man during DC Comics’ New 52 initiative. Both of those comics held strong connections, in plot and theme, to the series written by Alan Moore and Grant Morrison. Yet they both pale in comparison to their origins, lacking the innovation and bravery that set those comics apart. This emphasizes the way in which Ellis chooses to end the comic. Although Jack Carter may not really be dead, he chooses to take on a new identity. 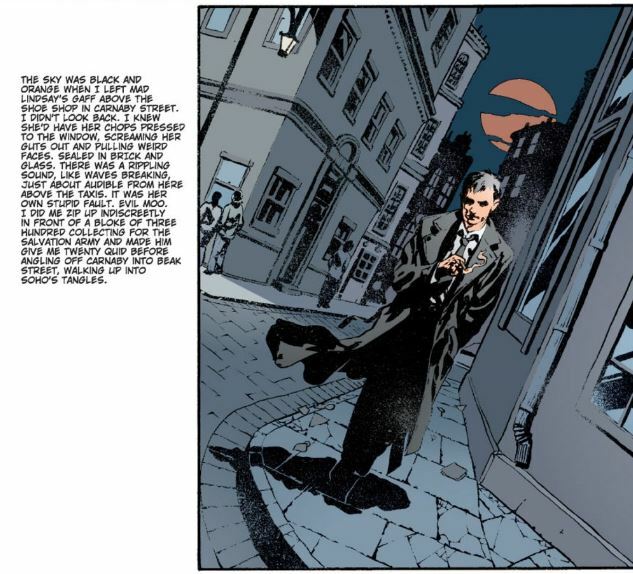 In changing himself, he subverts faking his death and transforms the issue into a funeral for John Constantine. He transforms himself into a recognizable and, relatively, new character though. What do you think Ellis and Cassaday are attempting to say by creating this very obvious transition? RS: Published from 1997 to 2002, Transmetropolitan can be seen as kind of a bridge of sorts between the two centuries. Although the series is set sometime in the 23rd century, its futuristic stylings and were very appropriate for the end of the 20th century. 2000 was, after all, supposed to be the year for science fiction to become reality through technological evolution. Arguably, it didn’t fail at living up to some of these expectations, despite our persistent lack of flying cars. 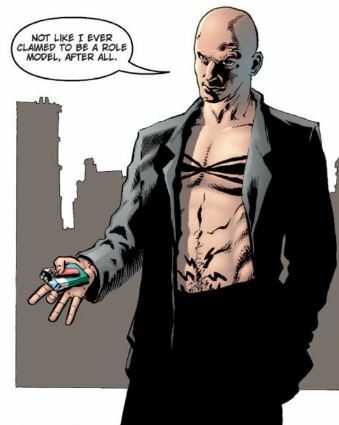 Spider Jerusalem, a character created by Ellis and and Robertson, is from the future and therefore represents the future in Planetary #7. 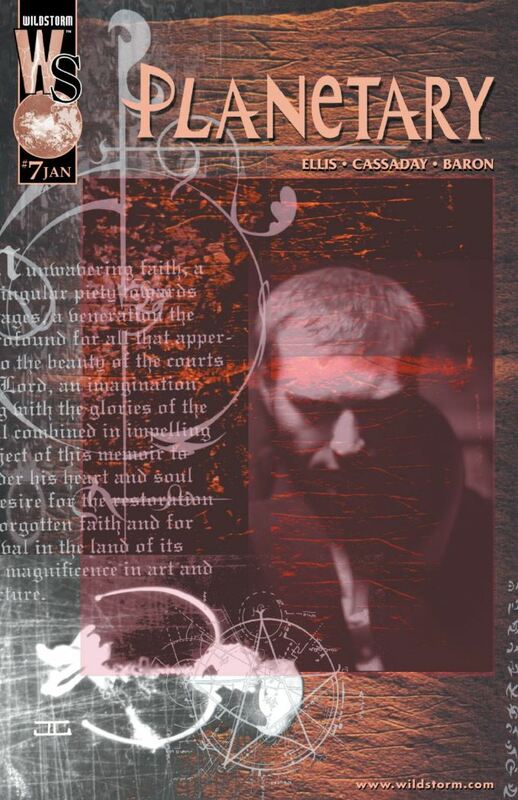 Regarding Cassaday’s several allusions to Robertson’s style, there is the possible acknowledgement that Robertson’s style, too, is the cusp of the 21st century. Considering that Robertson’s realistic style is part of a school of art that first came out in comic books in the late 90’s and has persevered for over 15 years, Cassaday’s claim doesn’t seem too outlandish. Before realism and cinematic styles became the dominant comic book art style, the 90’s were known for exaggeration more than anything else. Unrealistic body proportions and numerous lines were both important elements of “x-treme” style. Arguably, realism could be seen as the pendulum swinging the other way in regards of providing less unnecessary detail and correcting human anatomy. Similarly, Miracleman (or Marvelman, depending on your area) represents another pendulum swing. A few of the same British creators who brought us the grim and gritty stories and retellings that this character stands for seem to now be quite over them. Ellis is not the only one to criticize this era. In fact, I initially mistook this pastiche for Shazam (originally named Captain Marvel), thinking that Ellis, like Grant Morrison, had remorse over the “maturation” of the children’s character. It’s interesting, Chase, how you find this character obnoxious, because I thought he was so depressing. As of the time of this writing, we still have a few days to go before Multiversity #1 is published. Among the seven Multiversity issues, Morrison has announced one to be an all-ages comic that features the Marvel (Shazam?) family. This is significant because of the characters’ treatment in the most recent years. The morbid 80’s characters that we see in this issue of Planetary were largely either original creations or reboots of long-forgotten DC properties whose creators had a lot of flexibility in what could be done with them. To the point: while many of these characters’ dark stories were appropriate for both their creators’ time period and setting, the same tone stretched out toward the rest of the comic book industry. Thus, characters like Captain Marvel’s tone were completely changed from original intent due to to the company’s interest in selling them to adult readers. Shazam and Miracleman were designed to be positive forces for the future, not grim commentary on the present. While turning Miracleman dark may have worked well on a literary level, I can’t think of a time in Shazam where making him “mature” really resonated. Both situations, regardless of whether or not they “worked,” however, are inherently negative. This goes against the kind of positive change that Planetary, while actually mature, preaches. This isn’t the place to go over how DC and Marvel vastly undercut themselves back in the early 90’s by limiting themselves creatively in such ways, but Planetary #7 remarks on turning away from that. John Constantine was an original character introduced in a rebooted Swamp Thing — and he himself has been rebooted in the 21st century to something different. Not the kind of different Ellis and Cassaday try to express here, which is perhaps a heck of a lot more optimistic, potential-wise, than the kind of Constantine we have right now, but it’s a newness. Regardless the publishing business’s faults, there will always be new comics and new stories to tell. The medium isn’t dead; it has a new life with each unique telling. And that’s what matters. – In addition to the many obvious allusions to Vertigo titles from the 1980’s, there is even a reference to a specific issue. The analogs of Dream and Death from Sandman are seen feeding pigeons together in one panel. This is a callback to Sandman #8, “The Sound of Her Wings”, commonly viewed as the breakthrough issue of the series. – The Drummer throws his WHAM! soda again in this issue. It’s little cues like this that make such an odd character appeal to me. There’s a story behind why he’s always drinking this obscure fictional brand that we may never know. – Although American comics reaped many great creators from England and Ireland during Margaret Thatcher’s time as Prime Minister, many great creators stayed at home as well. 2000 A.D.’s output during this period is truly incredible. For anyone interested in reactions to Thatcherism in comics, Nemesis the Warlock is essential reading. -The Drummer makes Planetary certainly stick out in one panel where he plays a GameBoy Color during the cemetery sequence. Although another detail meant to highlight the quirkiness his character, the presence of the console firmly plants the team in a very 90’s time while every other character who surrounds the remains very 80’s. -With all the homages to different artists, the Hellblazer story-telling style, and various characters, this issue very much ties Planetary to its larger belonging within the comic book medium. Novels and other fictional mediums have always borrowed heavily from one another (Ex. The Bible—>John Milton’s “Paradise Lost”—>Mary Shelley’s Frankenstein—>the science fiction genre) and Planetary does an excellent job of tracing the historical legacy of comic books while also carrying its own stories.